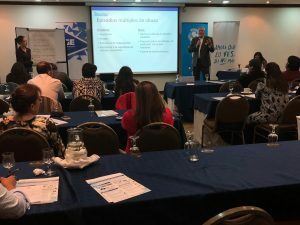 Huntsville, Alabama – The National Children’s Advocacy Center (NCAC) Training Center has partnered with UNICEF Ecuador to provide expert training for psychologists, prosecutors and judges working with child abuse victims in Ecuador. In July and August, 43 psychologists in Quito, Ecuador attended Forensic Interviewing of Children Training led by Linda Cordisco Steele, M.Ed., LPC who serves as the Curriculum Chair and Senior Trainer at NCAC. Likewise, NCAC Executive Director, Chris Newlin, MS, LPC provided training to 41 prosecutors in Quito on the Role of a Prosecutor in the Forensic Interview Process within the Framework of a Multidisciplinary Team Model (MDT). Newlin will return to Ecuador later in August to provide the same trainings to psychologists and prosecutors in the city of Guayaquil. In September, Newlin will return to Ecuador to provide training and consultation for judges regarding Best Interests of the Child in Judicial Decisions & Judicial Interpretation. In addition, while in Ecuador in July, Newlin met with UNICEF Ecuador and government representatives to discuss the process to implement country-wide policy changes to improve the multidisciplinary response to child abuse allegations in a child-centered manner, modeling their interventions after the approach developed by the NCAC. These meetings resulted in discussion about future opportunities for training and consultation in Ecuador and throughout Latin America. The NCAC has previously provided training in multiple Latin American countries. “It has been essential to count on the expertise of the National Children Advocacy Center in order to move forward with the work of ensuring access to justice for children in Ecuador. Particularly for children who have survived sexual abuse, those that deserve and have the right not to be revictimized,” said Ludimila Palazzo, Child Protection Specialist. “UNICEF in Ecuador is very proud to say that every justice operator engaged in the attention of such cases have been trained by highly specialized experts, which not only has the knowledge but a great methodology and approach to change the way justice professionals operate in the best interest of children”. The NCAC was established in 1985 as the first Children’s Advocacy Center (CAC) in the world. Since its inception, NCAC has served as a global model for the 1000 CACs worldwide. During the past decade the international community has increasingly implemented the MDT concept of the CAC model, and there are now CACs functioning in more than 33 countries. The CAC and MDT concept revolutionized child sexual abuse investigations. The approach calls for a child-friendly, safe environment for the child and family, where the child can be interviewed, examined, and counseled. It is also the place where MDT members come together to coordinate, discuss, and investigate child abuse cases. This approach limits the number of times a child must tell their story and in turn prevents more trauma for the child and allows the child and caregivers to access a full range of support and health services. The NCAC Training Center provides training for child abuse professionals through online trainings, technical assistance, resources, such as CALiOTM (Child Abuse Library Online), in-person trainings in Huntsville, including the annual International Symposium on Child Abuse, and customized trainings all over the United States and throughout the world. The NCAC offers International trainings including: The MDT Response to Child Sexual Abuse and Exploitation, Multidisciplinary Team Development, Forensic Interviewing of Children utilizing the internationally-recognized NCAC Child Forensic Interview Structure, and more. To date, in 2018, the NCAC Training Center has trained more than 13,600 child maltreatment professionals, with ten more in-person trainings scheduled before year’s end. The NCAC Training Center is part of the NCAC campus that serves as the Child Advocacy Center for Madison County. NCAC’s professional trainers are also part of the MDT serving the children of Madison County. While providing the training and outreach in Ecuador, the NCAC continued to serve the children of Madison County by conducting 90 forensic interviews and 236 therapy sessions during the month of July and the first three weeks of August. The mission of the National Children’s Advocacy Center (NCAC) is to Model, Promote, and Deliver Excellence in Child Abuse Response and Prevention through Service, Education, and Leadership. The NCAC is the birthplace of the Children’s Advocacy Center (CAC) model; and since opening its doors 35 years ago has served as a model for more than 1,000 CACs operating in all 50 states and in 33 countries. In addition to providing local services to children and families, the NCAC is one of the leading global organizations providing training and technical assistance to child abuse response professionals. Since 1985, more than 138,000 child abuse professionals from all 50 states and 129 countries have been trained by the NCAC with international training and technical assistance focusing on development of national policies providing for the protection of children, implementation of the multidisciplinary response (CAC) model for child abuse, and development of national training programs.